I will be heading to the airport this morning so I can attempt climbing in the Archer. Mary will be with me just in case I get to carried away and want to start 679er and go for a quick ride. After my boarding attempt I am going to take my Bride out for lunch at a new spot I read about just across the state line in Pennsylvania. Is this the adventure you ask? No, just what's on tap for today, now as they say "the rest of the story". Mary and I both want to explore the great state of Maine. So for our first trip after my surgery we are going to visit Stonington. Stonington is a town in Hancock County, settled in 1762 and known as Green's Landing before it incorporated on February 18, 1897 from a portion of the town of Deer Isle. Its name implies the great quarries, four of which were developed after 1870 and supplied material for many buildings in New York City and the Museum of Fine Arts in Boston. Fishing and, increasingly, summer residences provide the mainstay of the local economy. Stonington hosts three nature preserves, the following two managed by the Nature Conservancy. The Crockett Cove Woods forest covers 100 acres where thick mosses shroud the granite boulders, and old man’s beard lichen veils the trees. The area has a self-guiding nature trail and good bird watching opportunities.The Wreck Island Preserve features open fields and some spruce. Once used to graze sheep the ground is covered with woodland flowers and grassy fields make up most of the interior. Pilot Get-Aways did a really nice write up and that helped us finalize the plan. Our destination Airport is Stonington Municipal Airport which is a public airport located one mile northwest of the central business district, thankfully our hotel will pick us up when we arrive. The airport covers 12 acres and has one runway. It provides service to private and charter aircraft traffic only. 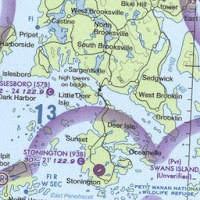 Stonington is located on Deer Isle which is only reachable by auto via a long, narrow suspension bridge, that I will most definitely have to check out. Stonington, Maine If you’ve ever considered visiting Maine, summer is the best time to make the trip. Authors Cal Thomas and Janie Phillips take you to Stonington, at the southern tip of Deer Isle. It is easily accessed by aircraft, and with dozens of other nearby islands, this is a kayaker’s paradise. Nearby Isle du Haut is home to the most pristine portions of Arcadia National Park, with 18 miles of hiking trails through forests, marshes, and shorelines. Other maritime adventures include canoeing, sail boating, charter cruises, and island camping. In the town of Stonington, Main Street is just right for strolling its art galleries, shops, museums, and restaurants, and the ocean is right beside you. You can catch the show at the Stonington Opera House that has a year-round schedule of concerts, films, and other performances. When it’s time to retire for the evening, you’ll have numerous unique bed & breakfast establishments or inns to choose from. In a place like this, you’d guess the seafood would be fabulous, and you’d be right—the freshest Maine lobster, crab, and other delicacies tempt you from restaurants situated right on the water. Pair your meal with a local microbrew, and you’ll understand why the locals love this town! We already made our reservations for a four day mini vacation and I scheduled 679er online. 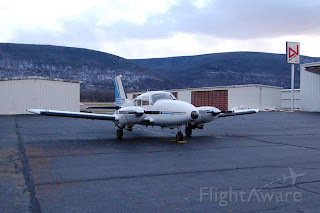 The plan is to visit the Stonington area, then rent a car after taking 679er on a short hop to Hancock County-Bar Harbor airport to explore Bar Harbor. It will be nice to take some time off for us after all this surgery/recovery time. I will post more details and flight planning as the date gets closer. I scooted out to the airport this morning trying to cross off one of my things on my list to accomplish. Mary went with me and supervised as I tried to board 679er. I was happy to see that the step up to the wing was a short one, that would make it a bit easier for the right leg and knee. However, looking at the first step with the left I don't seem to remember it being that much of a step as it now seems to be. None the less, it was time to give it a go. I set my cane aside and balanced on the wing with my right hand, avoiding any pressure on the flap area. Next I made the step up to the foot peg or step and as my left foot was firmly in place my right knee buckled. I did manage to catch myself on the wing to avoid hitting the ground. I was not happy with that try but decided to not go again until I had a step stool to help relieve some of the distance and pressure required on my new hip and finicky knee. I'll try it again this weekend once I find a one or two step type stool to help out. I still think I could back into a Cessna and wiggle in to the left seat, for now. I hope to report mission accomplished tomorrow as I sit and dream about flying once again from the left seat of 679er. 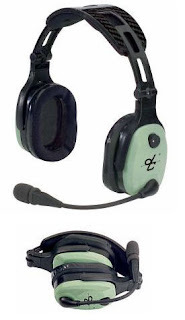 I purchased a new headset (DC X11) for Mary to replace her David Clark H10-13.4s that she has refused to part with. Last year I replaced my very same type set with a new lightspeed zulu headset and I have to say the quiet experience is fantastic. The X11's are the same as my zulu's in that they both are ANR (Active Noise Reduction) headsets and both have the ability to connect music and cell phone without having to slip earphones under the headset earcup. That's right, no more messy wires dangling, instead, a clean cockpit and quiet comfort with added protection for Mary's hearing. We'll give the new headset a test run and see how she likes it. The clamping pressure on her head will be less and the new unit is very lightweight, all great features when in the air on long trips. The extra quiet will also be nice when she likes to.....um..."cat nap".....while we get from point A to point B. 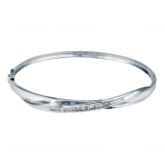 As a second part of this 'thank-you' I purchased a very nice Helzberg White Gold Diamond Bangle Bracelet to give Mary as a special gift for all she has done to take care of me, drive me around (while I drove her nuts with my right seat driving lectures) and make sure I was safe during my hip replacement/revision recovery. My Bride has been there every step of the way, from the first full day (and night) of surgery to the physical therapy accomplishments along the way. I could not have made it without her. Mary jokes and tells people this was our retirement test, I'm just happy she hasn't held me under the water in the hot tub until the bubbles stopped........I guess this means we passed that test. Thanks for being my best friend and Bride, I love you Mary! Wow, what news today at my follow up visit with the Doctor. First things first I was herded off to x-ray for some new pictures and we added two with an arrow pointing to the spot where I still feel some sort of nerve related pains (see after 10 weeks I can play doctor). Once the leg goes into the relax mode this one spot sends a streak of pain across the thigh starting at my incision, sort of like peeling back a layer of skin. After looking at the x-ray it seems this 'hot spot' is located right at one of the wire braided ties holding the bone graft and femur together, we hope the muscle gets used to the braided tie location, they will be sharing space for the rest of my days. Next up we headed back to the examination room and on the way the Doc said "loose the crutches", I stopped, looked at Mary and asked, what did he say. Doc once again said loose the crutches and let me see you walk full weight bearing, one step at a time and let me know what you're feeling. Ok, I admit I was immediately stuck in stupid but did follow his instructions and shed the sticks. I gave it a go and took maybe five steps and it felt pretty good with only some discomfort around my knee and the quad muscle straining a bit. I turned and walked back, still favoring the right leg, not quite ready to trust it completely. I was given a script for four more weeks of physical therapy and we made an appointment to come back for new pictures in four weeks. Yep, four weeks! If I could have danced the jig I would have, but I was to afraid I might fall. I was also cleared to drive! Now the Doc did say don't throw the sticks away just yet. Going full weight bearing was not as easy as just walking about, he said it would really take a toll on me and when I felt that the leg was starting to feel weak I was to get back on the sticks ASAP. My next visit is scheduled for Monday, July 13th. At that time I should, fingers crossed, be cleared to return to work and cleared to fly! Yeah, you read that correct, CLEARED TO FLY! My flight physical is due by the end of July so as things continue to move forward and I'm motoring about in good fashion I'll get the physical scheduled. Mary will be keeping a watchful eye on my quest to return to the cockpit, she's as eager as I am but, we both want to stay safe. That's all for now.....I owe my wife a dance and I may take HER for ice cream tonight! Yeah, that title sounds kind of girly (no offense ladies) but today brings mixed signals to this brain of mine. Today was the day I had planned to launch for Gaston's White River Resort, America's #1 Trout Fishing Resort, on the White River in the Arkansas Ozarks for the annual Gaston's Fly In. My surgery and recovery have wiped those thoughts out, but at least I can plan for next year. Last night Mary and I met with fellow pilots at Wings field for a "send off" of sorts for those pilots that are going to make the trip. Ted from Williamsport headed to Bridgeport, CT (KBDR) to pick up Julia and then turn the "Aztruck", as he affectionately calls his aircraft, southwest to meet the group at Wings KLOM. Meanwhile, back at the ranch.......no wrong story. Meanwhile Southwest airline was transporting Adam to Philadelphia. Lee was waiting for AdamB, Mary and I battled traffic on the blue route (I-476) that was bumper to bumper due to a downed tree blocking the right lane, Rob was holding the fort at Wings along with AdamZ and GaryS. We finally arrived at Wings about the same time Andrew pulled in so things were looking good as far as the timing. The road crew cleared the tree and Lee and AdamB made pretty good time to meet the group as we all tracked Ted taking the Atlantic scenic tour south of Long Island then west over NJ and finally into Wings. We all enjoyed the camaraderie of sharing this passion for flying and meeting with good friends. We also didn't do to bad breaking bread with two pizzas, two jumbo Italian Hoagies and refreshments. I happened to catch a bit of info on facebook that today was Ted's birthday so Mary ducked into Superfresh and since there were no birthday cakes left, she picked up a strawberry shortcake number that we substituted for his birthday cake. No we didn't sing but AdamZ did suggest he sing the birthday song himself, out loud, for all of us to hear, he declined. As fun as it was to sit and chat Ted, AdamB and Julia had to saddle back up and head to Williamsport. We all said our goodbyes, wished them a safe flight home and a safe fun flight in the morning as they launch for Gaston's. Mary and I headed south on I-476, smooth sailing, no traffic and in good time. The mixed emotions title just notes how much I wished I was making this trip. Last year we cancelled out and went to Sun-N-Fun in Florida instead and this year was out of my control. Maybe next year, who knows. The one really bright spot in all this travel talk is that I went to total my log book just to see where seven or eight hours each way would have left my totals.......when I looked at what my hours were to date I felt much better and that's without adding the trip I'm not going to make. I finally smashed the 300 hour mark!! 301.3 to be exact!! I guess I can handle not making the Gaston's run for now, but I'll be ready for next year! I received an email from the owner of our club plane and it really made my day! Our agreement is that total carry over time will be 10 hours a month, I've never had the chance to experience that, been to busy flying. However, with my surgery I have piled up 12 hours as of the end of June. My plan was to try and make the North East Flyers Mystic Seaport fly in the end of June and burn up enough time to keep me in the 10 hour limit. The email stated that I could build my hours and he would wave the 10 hour limit while I recoup. The initial thought to the rule was to stop people from not flying in the winter months and everyone cram hours in over the summer. With this new thought in mind I opened up our "4-day" get-away file and started to plan our first trip when I'm ready to sit left seat. 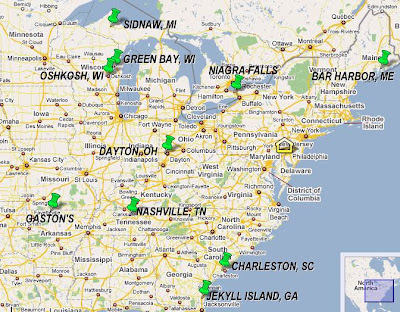 A few places that Mary and I would like to visit include Bar Harbor Maine, Charleston South Carolina, Niagra Falls Canada and Jekyll Island Georgia. I would like to take a few guy flights too, out to visit with Steve in Ohio for a ride in a cub, a trip to Ed's place at Prickett-Grooms Field located in Sidnaw, MI for the annual labor day bash, also a stop at Waukegan Regional to meet fellow blogger Tom on my way to Green Bay, schedule and complete my Instrument check ride, the Hudson river tour with another pilot who has made the trip and a few other places to visit with fellow bloggers and friends. 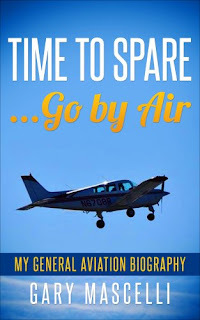 One special trip that is on tap for October will be to Williamsburg, VA to meet up with the man who got me started blogging about my lessons and flying adventures after reading about his airplane purchase and (as he calls it)magic carpet rides with his wife, The webmaster of Flights of The Mouse. Today I was scheduled to visit with my doctor to plan a course of action for my weight bearing status. The appointment was set for 9am and I was ready to go. Mary did the driving and we arrived early as we always do. The first step was to get an updated set of X-Rays, as opposed to the set that was taken just three weeks ago. Dr. S compares all the shots every time we meet and determines the stability of the new hip while looking for any settlement in the femur and signs of healing along the spiral fracture. Speaking of the spiral fracture, I had previously stated that it was about a third of the femur. Not so, the spiral fracture actually extends at least twelve inches, I really felt better thinking what "I" was thinking. Sometimes no news is good news, not the case this time but at least it's healing and so far looking pretty good. 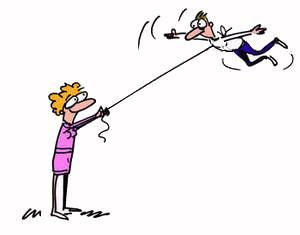 I am going to start Physical Therapy (physical torture)tomorrow with an initial evaluation at Pro Therapy. Following the evaluation I will be scheduled three times a week until I'm back to full weight bearing. I did get the go ahead to start with fifty pounds of pressure that I can apply to the right leg. The instructions will be to use a typical bathroom scale and with my right foot press down until I reach the magical 50lb mark. Hey, sounds strange but I'm following orders and I just want to get better. Next week I can progress to 100 lb of pressure and see how that goes. If at any time I feel pain or something that is not the norm I am to call the doctors office asap. My next appointment is set for June 15th at 2pm for new pictures and hopefully more weight bearing advances. In case you are wondering I did ask if I could drive....yeah, he laughed too. I was told that when I am full weight bearing he will let me drive, great, I'm thinking maybe the end of June. I did ask if I could at least return to work and once again I got the same speech he tendered for my driving request. A bright note in all this is that he thinks I might be able to head back to work by July! I would like to be back in the office after the holiday so that is my personal goal. As I have learned after all this is that my goals really don't mean squat to the doctors but it helps my progress and they do seem to take notice as to how far I've come since surgery only seven and a half weeks ago.